Okay everyone. I have 23 type drawers to clean up and most are filled with type. So I will need lots of help idetifying each one. So I hope you are all up for the challenge! While on the subject, relative to the type, you say “clean.” I have some VERY dirty type and dingbats. They are both just plain dirty and also have thick ink build-up around the top 1/4 of the block. The dirty part is fairly easy to clean but the ink build area up is very difficult. Is there a way to chemically dissolve the ink without scrapping the surface? I obviously don’t want to do anything that will deteriorate the type surface or edges and fine detail. I have used a heavy duty engine degreaser and it works fairly well but I still end up needing to use a LOT of elbow grease the inky area or a brass brush, which marks the type edge. I don’t use the brush on the face. For the few pieces I am cleaning now that is OK. 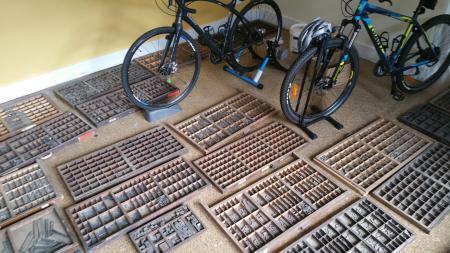 But I, also, have whole trays of older, used type that will need cleaning. Any ideas will be appreciated. Also, do you or anyone out there have a suggestion of a good book to buy to identify type? I can’t afford to buy five or six different books! Hunter6: if you are going to buy one book to identify type faces, assuming most of your type is American and from the 1900’s (vs the 1800’s), this is the book you want. It has one line specimens of virtually every American type face cast in the 1900’s, as well as some other popular faces, and revivals of 1800’s designs. Included with the specimens is info on who designed and cast the type, as well as other interesting remarks. Oh by the way, I know the new generation of letterpress people are changing the traditional terminology, but oldsters like me still use the traditional name for type drawers, which is type cases. Do you know what printer’s drawers are? They are the underwear under his trousers. Everyone would like a magic solution which will clean all the ink and dirt from the type without any damage and without lots of labor. I don’t know of any. For 60 years I have used a solution of TSP and a toothbrush to scrub each piece of type. I call it idiot work. I don’t use printers drawers, I go commando!